Plotting phase portraits and families of Initial Value Problems, and others. The software by itself comes with a file of scripts demonstrating many illustrative problems from Geometry (such as the Möbius surface outline) to a variety of celestial mechanics problems and basic mechanics problems such a pendulums (in folder Samples and under menu Demo). For each of these pre-loaded classical problems you will find suggested didactical comments below, or a teacher can provide own comments and explanation, as well as to add many other illustrative problems of his own interest. The three articles below exemplify various teaching ideas and topics for which the Taylor Center software happened to be beneficial or indispensable. * Is the highest accuracy in the Taylor method always achievable? An in-depth discussion of the types of numerical error and their sources, particularly the so called cancellation of subtraction catastrophic error. * Regular solutions of singular ODEs. This chapter brings and explains the idea that sometimes a regular holomorphic solution may satisfy ODEs having singularity at the point where the solution is regular. Moreover, in some functions there are regular points at which the function may satisfy only singular ODEs (in the class of rational or elementary ODEs). The demo role of the program is based on its feature to cope with ODEs having an isolated point of singularity which however is a regular point for the solution. * Weird examples of real valued solutions vs. their complex properties. Here (among others) is analyzed the function cos(sqrt(t)) which is regular at t=0 (when properly defined). It is explained how to integrate and plot this function for t<0 despite that it involves complex values. Gofen, Alexander (2012) "Using the Taylor Center to Teach ODEs," CODEE Journal: Vol. 9, Article 6. 2. A remarkable periodicity in a real valued extraction of a well known complex function (by A. Gofen, S. Lucas, J. Sochacki, 2014). however what attracted attention of the authors was a remarkable dynamic of evolution of this double spiral, animated by the program in real time. It seemed that each loop of the double spiral (no matter big or small) took the same time to run! 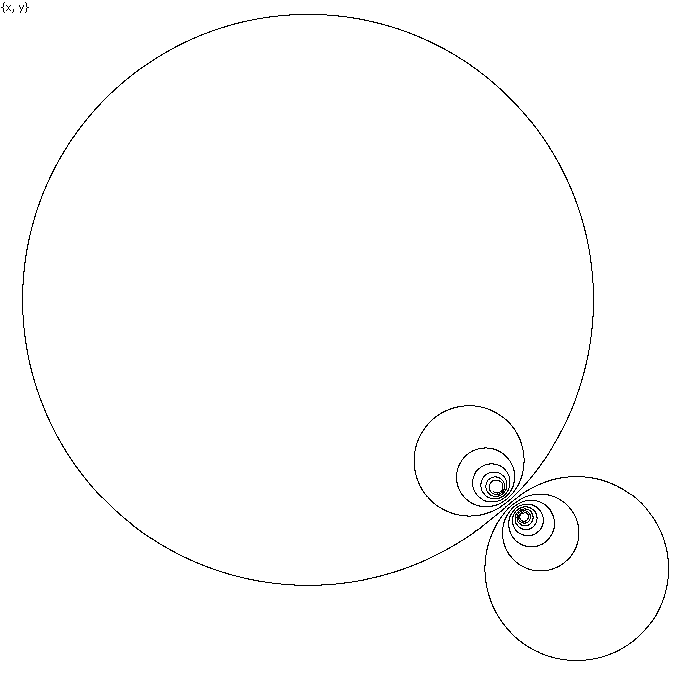 (See this example under Demo/Spirals/Double spiral). The program allowed to accurately compute the time spans taken by the loops - and they happened to be equal (up to the rounding error), confirming that the initial impression was based on the reality. representing the turned complex tangent function. On an intuitive level this fact immediately clarified the source of this remarkable time periodicity in the spiral loop, however it took certain efforts to prove this and a few other unexpected properties of the solutions of such systems. Therefore this research exemplifies a mathematical study triggered by observation of numerical experiments at a computer, followed by the conventional mathematical analysis of the observed phenomenon. Not only did this mathematical analysis succeed in establishing the proof and explanation for what was observed, but it also revealed existence of the critical asymptotic curve. This curve would have been impossible to find by numerical experiment only. The numerical experimenting and the analytic approaches complemented each other beautifully in discovering a remarkable property of a particular planar polynomial system of ODEs - presenting a powerful teaching moment. This paper is dedicated to the two classical transcendental functions: The locus of points for which powers commute, and the locus of points for which powers associate. These classical functions however are considered in a new perspective: as holomorphic solutions of ODEs yet passing over the points of singularity of these ODEs. y"x2y2(y – x) – (y')3x4 + (y')2yx2(3x – 2y) + y'y2x(3y – 2x) – y4 = 0 . Both ODEs have a singular point at (e,e) though the solution y(x) is holomorphic at this point. In order to obtain the Taylor expansion for y(x) at (e,e) the standard AD formulas are not applicable because of the singularity of these ODEs, so that the Taylor coefficients at this point must be obtained via special recursive formulas. As soon as these coefficients are available, the Taylor Center becomes helpful due to its capability to start integration even at a singular point of the ODEs if the solution is regular at this point and the special Taylor expansion of the solution is provided (from other sources). Thanks to this feature, the software can deal with the special ODEs studied here and pre-loaded into the distribution package so that the users can reproduce all the graphs referred in this article. Published in: Teaching Mathematics and Computer Science, 11/2, 2013, p. 241-254. The software comes with the folder Samples containing numerous ready to use samples of Initial Value Problems (IVPs) helpful for teaching. Exploratorium of Choreograhies for the planar Newtonian 3-body problem with equal masses, where you will find the explanation of the concept, the resources, and how to run 345 samples of Choreographies kindly submitted by Prof. Carles Simò. Exploratorium of periodic solutions recently discovered for the planar Newtonian 3-body problem with equal masses. The first colletion of 203 represents closed curves whose initial vectors were kindly provided thanks to Ana Hudomal. The second collection of 30 samples are the cases where the periods are represented with finite curved segments at whose extremes the bodies have zero velocities (i.e. they are in a free fall) - thanks to the data by Xiaoming LI and Shijun LIAO. The full description for all them (called Exploratorium) is in preparation. 1. From Pascal to Delphi to Object Pascal-2000. ACM SIGPLAN Notices, Vol. 36, No. 6, pp. 38-49 (2001). 2. Object vs. Class: Fewer Pointers, Less Double Thinking. Delphi Informant Magazine, Vol. 5, No. 7, pp. 47-52 (1999). An in-depth discussion about the direct (one-to-one mapped) variables vs. indirect and separated reference to variables in programming languages. 3. Dynamic Arrays. Delphi Informant Magazine, Vol. 6, No. 2, (2000). 4. Recursion Excursion. Delphi Informant Magazine, Vol. 6, No. 8, pp. 30-38 (2000). a code of an advanced calculator of expressions. a software emulator of the AD processor processing the list of AD instructions. implementation of the red/blue technique of viewing stereo pair using the graphic power of Delphi. The algorithm of plotting parametric 2D and 3D curves point by point based on their Taylor expansions guaranteeing their continuity. The algorithm of tube-like plotting 3D curves with resolution of skewing controversies in 3D stereo and in isometric plotting. The algorithm of real time playing trajectories according to their parametric representation as functions of time. The algorithm for obtaining ODEs in another state (in another independent variable) and switching the integration from one independent variable to another.